There was snow on the beach in Galveston, and 7 inches fell on cactuses in Corpus Christi. Someone made a snowman at the Alamo, and The New York Times, Newsweek, and The Guardian all reported on the weather phenomenon. Children who had never seen snow walked around with their heads thrown back and tongues poked out, tasting the frozen flakes and giddy with the possibility of school cancellations. 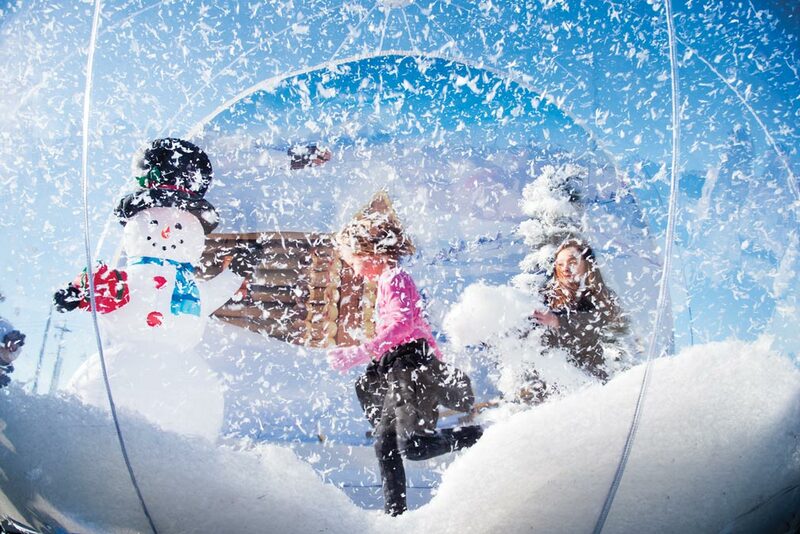 Snow may not be guaranteed from year to year, but you’re sure to find some frozen fun at these destinations—even if Mother Nature doesn’t cooperate. 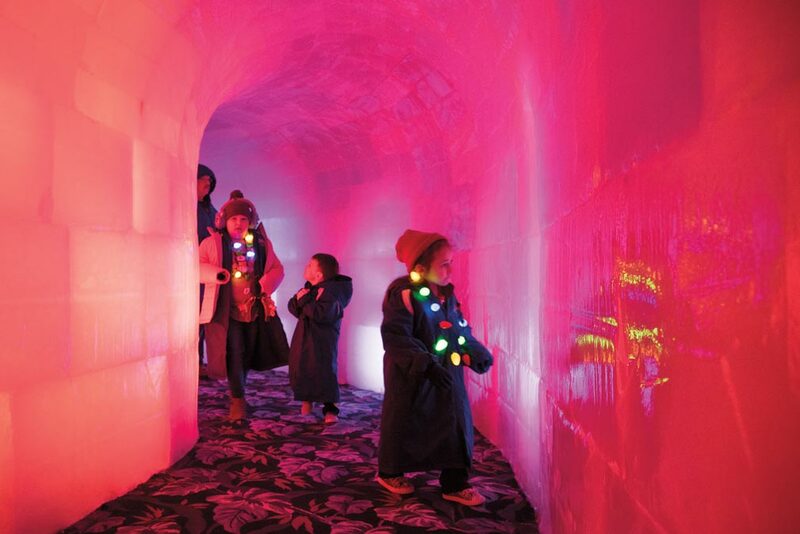 Visitors follow a winding pathway through icy tunnels and enchanting ice-created wildlife tableaus in a 28,000-square-foot tent next to the Moody Gardens Hotel, Spa & Convention Center. Moody Gardens, One Hope Blvd. The sculptures are carved by artisans from Harbin, China, home of the world’s largest ice festival and sculpture competition. The ice, glistening in vibrant hues, is colored with a mixture of milk and tempera paint and frozen into blocks. The artists then use chainsaws and chisels to create these frigid artworks. This year’s theme is “Pole to Pole,” with life-sized glossy penguins and polar bears. There’s also a bar and a slide made of ice in the structure, which is kept at 9 degrees for three months and is designed to withstand hurricane-force winds. Visitors can borrow coats but should bring some gloves and wear closed-toed shoes to ensure maximum warmth. 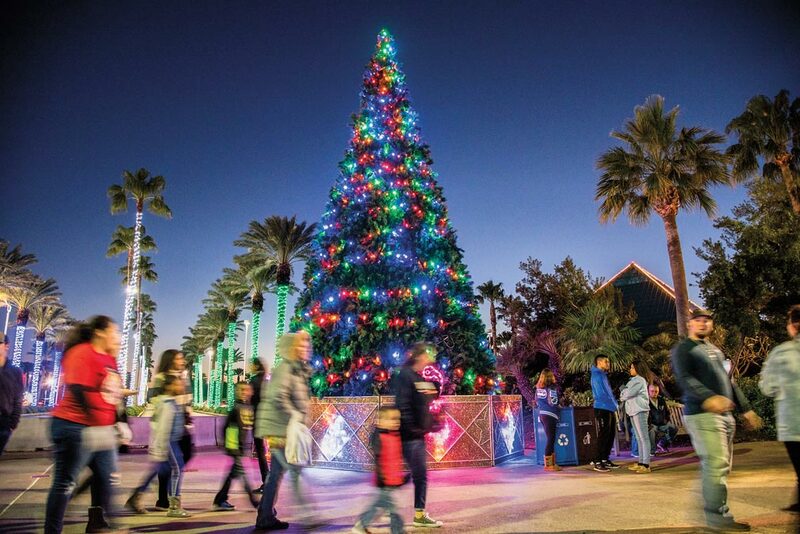 Outside, a 1-mile trail of lights winds around the iconic Moody Gardens pyramids, where the holiday fun continues with an ice-skating rink and outdoor arctic slide. Walk through the light trail while munching some kettle corn, and enjoy the contrast of the frozen chill of Ice Land with subtropical Galveston breezes. This Victorian-themed extravaganza is worthy of Scrooge and his Cratchit pals. Wear your finest Victorian garb to the parade, listen to holiday handbells, sing along with roving carolers, and slip back in time at the Strand Historic District, a national historic landmark. This suburb of the Dallas-Fort Worth Metroplex has good reason to call itself the Christmas Capital of Texas. Holiday spirit oozes through downtown with glittering storefronts, an idyllic main street with a town tree, a gazebo showered regularly with artificial snow, millions of lights, and a cozy Christmas train that ushers hundreds of kiddos to the North Pole to see Santa every holiday season. Nearby at the Grapevine Mills mall, there’s even a scuba-diving Santa Claus at SEA LIFE Aquarium. Santa swims at regularly scheduled times inside the tank with fish floating by and holds up a sign to let each child know if they’ve been naughty or nice. Nov. 9-Jan. 1 at 1501 Gaylord Trail. This sprawling resort becomes a Christmas gala each year with the ice sculpture extravaganza ICE! and holiday decor around every bend of its replica San Antonio Riverwalk. Before each tour of ICE!, a brief video explains how the sculptures are made (as in Galveston, Chinese sculptors hand-carve these works). Visitors are then fitted with long, insulated coats available in kids’ and adult sizes. As music fills the air, revelers make their way through the frozen wonderland, and the daring stop to ride ice slides, while others kick back with a frosty beverage at the bar. 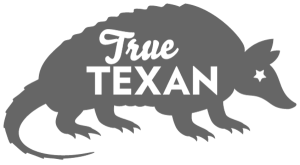 Add-on tickets are available for purchase for tubing down a set of thrilling indoor snow slides or testing one’s accuracy at throwing snowballs. All around is honest-to-goodness snow, made right in Texas. A West Texas blizzard blankets nearly half the Lone Star State in snow, devastating cattle and dairy operators in the Panhandle. Widespread snow falls mostly east of I-35. Several inches of snow blanket the northern half of the state. Over a foot of snow falls in many areas between Dallas and Lubbock. The Victoria Christmas snowstorm produces 12.5 inches of snow—a historic record. The only Texas city ever to receive more snow in a single holiday season was Amarillo, with 21.2 inches in 2000.